Chirashi sushi (Chirashizushi) is a Japanese delicacy. 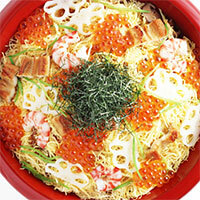 The meaning of Chirashi is 'scattered' so in other words, this dish is a bowl full of scattered ingredients. This dish is very versatile. Different regions in Japan have a slightly different recipe of this meal. Basic ingredient is Japanese cooked rice, mixed with many vegetables, spices, and fish. The fish used is often tuna, but depending on one’s liking, that can be changed. When it comes to spices: salt, sugar, vinegar (or sushi vinegar) or even wasabi is used. Vegetables used in this dish are shiitake mushrooms, cucumber, carrot, green onions, snow peas and tsukemono (Japanese pickles). Eggs and seafood are also fine ingredients added to this delicious meal. As it is obvious from the various ingredients listed, this dish is a great supplement of healthy everyday diet, and it is highly recommended for those who’d like to lose weight and remain healthy. The calories in Chirashi Sushi per 448.5g(1 medium sized serving) is 718 calories. Chirashi Sushi is calculated to be 160Cal per 100 grams making 80Cal equivalent to 50g with 92.66g of mostly carbohydrates、43.59g of protein、16.55g of fat in 448.5g while being rich in vitamins and minerals such as Iodine and Vitamin B12.